These place pacs contain Motomco’s most powerful single-feed anticoagulant rodenticide, Brodifacoum. This is a second generation anticoagulant. Jaguar is made with carefully selected food grade ingredients, resulting in proven palatability and rodent acceptance. Rodents can consume a lethal dose in a single night’s feeding. Rodents die 4 to 5 Days after consumption of a lethal dose. 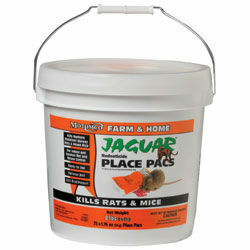 Place pacs protect bait and fit in tight areas.